Each committee serves a vital role towards the Mid-Hudson Valley Chapter's success. Interested in joining a committee? Contact mhvafp@gmail.com today! The is committee provides scholarships to fundraising professionals and nonprofit organizations in the Mid-Hudson Valley. The Committee helps to promote the Scholarship Program, reviews scholarship applications, selects recipients and helps to welcome and familiarize these new members with the benefits and activities of AFP. All AFP members, regardless of experience, are encouraged to join the committee. If you're interested, email Joan Gambeski. 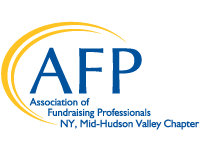 This committee supports and promotes the Mid-Hudson Valley Chapter and broader AFP activities, events and initiatives within the nonprofit community and beyond. We welcome all who are passionate about promoting philanthropy and nonprofit service, and who wish to share their strategic ideas and skills in social media, graphic design, e-marketing, public relations and website development. Join us as we work together to serve our membership and the nonprofit community, and help us promote, strengthen and enhance the value that MHVAFP and its members provide to the Hudson Valley region. Please contact Committee Chair, Maggie Sutter to join the Communications Committee. This committee seeks to enhance educational opportunities for development professionals in the area by coordinating engaging webinars, offering networking forums for members and nonmembers, and by supporting the National Philanthropy Day planning committee by helping coordinate speakers and presentations for this yearly event. The committee meets quarterly, and committee members must serve on the National Philanthropy Day planning committee. If you are interested in learning more about joining this committee, please contact Julie Stainton, Committee Chair. This committee actively promotes the benefits of AFP membership. Joining the membership committee is a great opportunity to expand your network and share your skills to advance the fundraising profession as well as learn new practices from your colleagues who have chosen to advance their networks and careers while enhancing member programs and services. Make an investment in your profession and yourself. Please contact Committee Chair, Debra Bogdanski if you are interested in joining the Membership Committee. Are you passionate about diversity and inclusion in fundraising? Join our team and help us work towards our committee's mission: seeking to achieve a broad representation of experiences, perspectives, and cultures to ensure the best possible thinking, ideas, opportunities, and solutions are considered; intentionally creating a respectful and welcoming environment that is open to all; and appreciating the unique contributions of every member of the community. We host one event per year, usually in July, and meet monthly by phone of in person. Seeking members from any and all backgrounds and experiences. If you are interested in joining this committee, please contact Sheba Abrahaim, Committee Co-Chair, or Mary Williams, Committee Co-Chair. The National Philanthropy Day Committee for the Mid-Hudson Valley Chapter is eager to welcome new members interested in contributing to the committee while learning how an event is developed. All AFP members regardless of experience are encouraged to join the committee. The event programming, speakers and awards will be re-evaluated to meet the interests of all of our members, and take the event to the next level. Please contact Sarah Pruschki or Melissa Dvozenja-Thomas, Committee Co-Chairs, if you are interested in joining this committee. This committee develops programs focused on youth empowerment and leadership, promotes awareness of the "common good" and social responsibility, enlightens youth about careers in the philanthropic and nonprofit sectors, and increases knowledge among youth regarding local community needs and the opportunities for youth to make a difference in the lives of others. The YIP Committee is also charged with obtaining qualified nominations for the YIP award presented in conjunction with National Philanthropy Day. Please contact Patti Archiere, Committee Chair, if you are interested in joining this committee. The goal of the Mentoring Committee is to provide structured networking and learning opportunities for AFP members by linking new and experienced fundraisers within AFP's Mid-Hudson Valley region. The members of the committee will work to promote mentoring opportunities available, collect and review applications, identify mentoring matches, and check in with mentors and mentees throughout the year to solicit feedback. If you are interested in joining the committee please contact Jennie Swantz, the Mentor Committe Chair. More information and applications will be available shortly.